Dr. Liu received his Ph.D. in Chemical and Biomolecular Engineering from the Korea Advanced Institute of Science and Technology in 2012. With a focus on nanomaterial, nanotechnology, biotechnology, and microfluidics for optical and electrical biosensor applications, he is interested in developing integrated platforms for biomedical diagnostic and clinical translation of extracellular vesicles (EVs). Together with colleagues, he has developed exosome-total-isolation-chip (ExoTIC) and EV hunter devices for simple and high-throughput isolation of EVs from different biological samples. He also demonstrated a nanoplasmonic method for quantification of EVs from plasma samples for diagnosis and treatment monitoring of pancreatic cancer. 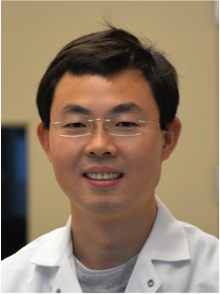 Dr. Liu has authored and co-authored over twenty papers, including Nature Biomedical Engineering, ACS Nano, Advanced Materials, Advanced Functional Materials, Small, etc.